2. I thank Your Excellency for your gracious words. I deeply appreciate the warm welcome and the generous hospitality accorded to me and my delegation. 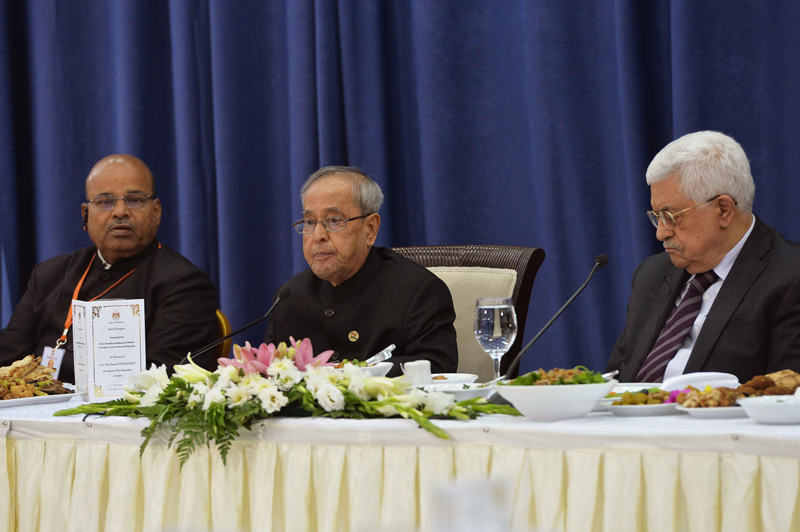 Your Excellency, the Palestinian leadership have displayed great faith and trust in relations with India. This has been evident during the visits of Your Excellency and late President Yasser Arafat to India. 3. At the very outset allow me to congratulate you on the historic installation of the national flag of Palestine at the United Nations on September 30, 2015. We share your pride and joy on this momentous occasion and also your sense of optimism that this is an important step towards the realization of the dream of the people of Palestine for a separate homeland. 4. Your Excellency, India attaches great importance to its long standing friendship with Palestine.India's empathy with the Palestinian cause and its friendship with the people of Palestine have become an integral part of our foreign policy.India has always stood beside Palestine. India'spolicy on Palestine has three core dimensions: solidarity with the Palestinian people; support to the Palestinian cause; and, partnership in Palestine's nation and capacity building efforts. The Indian leadership , across the political spectrum, remains unwavering and steadfast in its support for the Palestinian cause . 5. India is also keen to work with Palestine on the orientation and framework for our future relationship - based on the three pillars of closer political interactions: deeper economic engagement and academic collaboration; and wider cultural contacts and people-to-people exchanges. 6. Your Excellency, peace and stability in the region is in India's interest. We share the perception that resolution of the longstanding Palestinian issue will contribute to the peace and stability of the region. We are, therefore,concerned about the stalled peace process. India supports a negotiated solution, resulting in a sovereign, independent, viable and united State of Palestine with East Jerusalem as its capital. We would like to see the people of Palestine living within secure and recognized borders, side by side and at peace with Israel, as endorsed in the Arab Peace Initiative, the Quartet road map and relevant United Nations Security Council Resolutions. 7 We firmly believe that dialogue is the only viable option in the search for a just, durable, comprehensive and peaceful solution of the Palestinian issue. Diplomacy and statesmanship have to prevail over hatred and violence in the search for lasting and durable peace. 8. I would like to share my sincere hope of early resumption of the peace process between all relevant parties and pray that it will soon lead to the amicable resolution of conflict in this region. 9. Excellency, I am confident that the discussions we have had during my visit will lead to fruitful engagement and meaningful outcomes in all areas of our mutual interest. 10. In order to continue the tradition of friendly consultations between us, I would like to invite Your Excellency to visit India at a mutually convenient time. It would be an honour to receive you in New Delhi. 11. With these words, Excellency, I thank you once again for your gracious hospitality and wish you every success in your endeavours for peace and progress in Palestine. 12. I would also like to convey through you, the warm greetings of the people of India to their brothers and sisters in Palestine and our sincere wishes for their all round advancement, happiness and prosperity in the days to come .